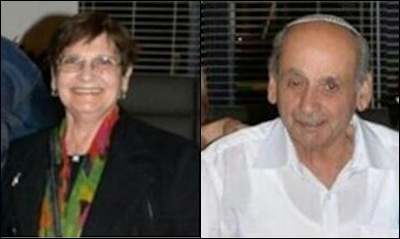 Haviv Haim (right), 78, was shot by a terrorist on a Jerusalem bus in October. His wife Shoshana was wounded. 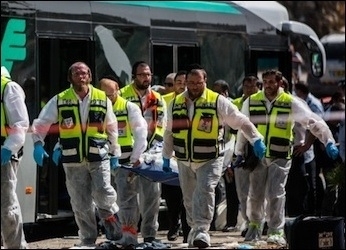 On October 13, 2015, two young Palestinian men affiliated with the Hamas movement, Baha Alian and Bilal Panem, boarded the 78 bus in Jerusalem's Armon Hanatziv neighborhood. The two were residents of Jabel Mukaber, an adjoining Arab village. That afternoon, at home in my apartment in a neighborhood on the other side of the valley from Armon Hanatziv, I received a message on my phone. The message was from an old army friend of mine, and asked if I had heard about what happened to Menash's father. The message caused me to stop in my tracks. The names of some of those killed had already been released. "Haviv Haim." And "Menash" meant Menashe Haim, the deputy company commander of the company in the IDF reserves in which I served for 17 years. I hadn't seen Menash for about three years, since I stopped doing reserve duty in the tank corps. I remembered him, though. He was an exceptional commander. I remembered him standing on the hull of a tank to address us all the day after we were called up for the Second Lebanon War in August 2006. Small, stocky, unshaven, black-haired and smiling. We were confused and a bit disoriented after the long night of the emergency call-up, arriving to the north. Haviv Haim's family left its native Iraq in the wake of the 1941 Farhud pogrom. They used to call him "pita" in the unit, after the round, flat bread eaten in the Middle East. This was because of a strange habit he had of substituting the word "pita" at random for various other words. "Go join those other pitas over there," he'd say, pointing to a crowd of soldiers. He wasn't laughing when I saw him in the shiva house in Armon Hanatziv the next day, with his blue t-shirt ripped as a sign of mourning. Haviv had died instantly, in the first burst of fire. His wife Shoshana, Menash's mother, was still in a coma, still in the hospital. They weren't sure at that stage if she would remember or know what had happened. (As it turned out, she remembered everything and knew her husband was dead straight away when she regained consciousness a few days later). There is an instinct in all of us to run away from death. To be where it is not. This is something that must be overcome. The apartment was full of people and it was overcome. The blank horror of the murder, the savagery, out of nowhere, an elderly couple, returning from a doctors' appointment, defenseless. Yes, all very clear. The family is from Baghdad and Erbil. They left in the wake of the Farhud pogrom of 1941 amid the growing fears of Iraq's Jews as Arab nationalism rose and painted their doors in anticipation of slaughters to come and what might be inherited. Jerusalem. The Seventh Armored Brigade. The wars of establishment and defense. Five children. Fourteen grandchildren. Life ending on a bright Jerusalem morning. All their fine sons not able to help them. "We're not here for a short time. We're here to stay. We're in a long struggle," Menash told me, as we sat on the sofa in his parents' apartment. "The one who can endure most will win. Who can endure most. But also, in the end we'll live in peace." "You haven't changed," I said to him. All words seemed tiny and feeble. Later on that October, Netanyahu made ill-advised comments about the Holocaust and Hitler and Haj Amin al-Husseini. He seemed to blame the mufti for Hitler's attempt to kill all the Jews in the world, a wrongheaded accusation he later walked back. But it certainly was the mufti who stirred up the people of Baghdad for the Farhud pogrom after arriving there in 1939. A matter of historical record. And it was the mufti who popularized the insane fears of a Jewish threat to al-Aqsa mosque, the same claim that underlies the current campaign of murder. He and his like have been trying to make the life of the Hayim family of Jerusalem and Baghdad and Erbil unlivable for most of the last century, and I suppose a while before that, too. They won't succeed. I walked home back to Abu Tor through the valley. A brilliant blue and gold Jerusalem afternoon. The air clear and everything vivid as it only ever is in this city. Days of insanity come again. The only thing between now and the time of the Farhud is the structures we have built for our defense. Maintained with sweat and tears and blood and love. The one who can endure most will win.